The key to our facials lies in balance and revive the natural body system—At Aura skin care and laser face treatments are designed to support both. At aura our Esthetician use, rhythmic, caring touch to guide you to balance and serenity, supporting skin health by calming the mind and by stimulating lymph flow/Collagen synthesis/ Self-healing abilities manually and by advance procedure of this industry to promote its self-cleansing/healing/revitalizing processes. At aura skin care and laser, we recognized the power of Revive and envisioned a way to use natural process of skin to revive itself without the use of alcohol/acids or artificial products. Combining the selected blends of products and the power of touch and advance procedure of machines we support the skin’s natural processes of self-cleansing and renewal to bring forth your own inherent radiant beauty. The Ultrasonic / Microcurrent / Radio frequency/Skin Scrubber separately or combo is truly revolutionary non-surgical instant face lift treatment. An ultrasonic facial, high level sound wave technology (Input: 1-3 MHZ) is used to penetrate deeper the surface of the skin and promoting cellular renewal and repair, tone the facial muscles, enhance the flow of lymphatic drainage, boost the blood circulation, turn down the puffiness of cheeks and around the eyes and improve the skin care products penetration. The Skin Scrubber one of the safest technology with safe high frequency vibrations (28,000Hz) scientifically designed to remove any imperfections under the skin such as dead skin cells, black and white heads, dirt, and grease particles. The added benefit is a lifted effect that creates ultra-smooth, soft firm and supremely elastic skin. Radio Frequency is latest technology in the aesthetic industry for tropically help in skin tightening and firming. In RF Facial The technique that uses: RF energy to heat tissue and stimulate sub-dermal collagen production to reduce the appearance of fine lines and saggy loose skin. The technique induces tissue remodeling and production of new collagen and elastin. Other words improve the micro-circulation of the dermis. Standard /Regular or non medi facials are often performed at salons and spas for a relaxing, cleansing or massage experience. They may apply masks, serums or moisturizers to the skin. These facials aim to cleanse, exfoliate and extract impurities, but they do not manage significant skin problems. A clinical facial treatment is a little different. Clinical/Medi facial treatments are scientifically proven to assist in the correction of skin disorders like acne, pigmentation, and rosacea as well as the prevention of premature aging and performed by specifically trained medical aestheticians the main purpose of a clinical facial is to treat the skin from a medical health perspective to promote lifelong healthy skin using physicians (highly active ingredients) formulas that are only offered by medical aestheticians. Why I choose a clinical facial? Please keep in mind that clinical facials do not treat sagging skin, bulges or deep wrinkles. More severe skin issues may require other cosmetic procedures, like laser resurfacing, Micro Needling or Chemical peels. Medical esthetician of Aura skin care and Laser can help you decide if a clinical facial is right for you. Clinical facials are outpatient treatments, meaning you can return to your regular day shortly after your facial is over. Your aesthetician will first evaluate your skin type and any skin conditions you may have, and then determine what medical-grade products should be used on your skin. Next, your aesthetician will cleanse the skin thoroughly. He or she will perform a mini-microdermabrasion to exfoliate and slough away dead skin cells. 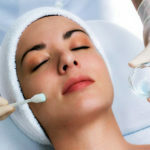 After the microdermabrasion, a light chemical solution, typically a mix of AHAs (alpha hydroxy acids) and BHAs (beta hydroxy acids), Mandalic or Ferulic solutions is applied to small areas of the skin using layer techniques. The treatment normally lasts anywhere from 15 to 60 minutes, depending on the area being treated. Our Medical aesthetician can guide you through your treatment and address any questions or concerns you may have to make sure you feel comfortable. Also available for Neck, Decollate’ and back Acne and pigmentation Contact to our best Medical Aestheticians for more information. At aura skin care and laser our Medical Esthetician recognized the nature of the skin how to revive itself with different procedures and techniques. At aura skin care and laser Micro needling is a process- involving tiny microscopic needles used to target collagen in the dermis of the patient’s skin. By stimulating collagen, and exfoliating the skin at the same time, this treatment helps speed up cell turnover rate, plump the skin, and retain the skin’s water level for a moisturized look and soft feel. Reduce appearance of stretch marks — yes — it can be performed on the body as well! Lessen the appearance of acne, acne scarring, and decrease the frequency of acne breakouts. Dermaplaning will not cause fine vellus hair to grow back thicker or darker; in fact, Dermaplaning simply trims vellus hair, or “peach fuzz,” from the skin’s surface, keeping hair follicles intact. Over time, and with continued Dermaplaning treatments, vellus hair appears even finer. Immediately following your Dermaplaning treatment, patients can return to their regular activities and enjoy instantly smoother skin. A noticeable improvement is immediate with smoother texture and fresh skin appearance. Hair returns softly and will not become coarser because of the treatment. Even products penetrate the skin better following this treatment. The only skin that probably shouldn’t be treated with Dermaplaning is acne-prone skin. Why one should choose Dermaplaning? (b) thickening and smoothing the epidermis. (c) Fibroblast activity results in extracellular matrix deposition and dermal thickening. (d) Infusion of Antioxidants introduced through the procedure hydrate and decrease inflammation in the skin, reversing photo damage, while protecting lipid membranes, collagen fibers, and enzyme systems. Why I Choose Hydra Dermabrasion? To Reduces the appearance of scarring, stretch marks, softens fine lines & smooth the rough skin. Also helps in evens out skin tone & fades superficial scars. Hydrate anti oxidants and serums use to nourish and protect. Add LED light therapy or Micro Current or Radio Frequency Treatment for rejuvenation. For hands or other body parts contact our Medical Esthetic Practitioner. Microdermabrasion is a mechanical form of skin exfoliation using a diamond crystal wand combined with suction. It exfoliates the upper layers of skin and stimulates collagen growth in the lower layers. This progressive non-invasive procedure reveals newer brighter and healthier looking skin. A microdermabrasion is a process that offers safe and controlled exfoliation of the skin. This procedure utilizes medical grade micro-crystals, which are slightly scratch the outer layers od dead cells. At the same time, debris and dead cells are vacuumed into a sealed waste container. This technique if fast, relatively painless, and results can be seen immediately. Microdermabrasion creates blood flow to the surface of the skin, increasing oxygenation which encourages cell renewal. Recent studies have proven that it also stimulates the growth of new collagen. The treatment creates a flushing and cleansing effect below the skin’s surface resulting in a vibrant, healthy appearance and complexion. How much this treatment cost Me? Microdermabrasion facial 60 minutes $120. Also available for other body parts contact Aura skin care and Laser for more information. Light based facials are one of the moderate skin rejuvenation processes. Use of Intense Pulse Light (IPL) allows clients to transform red, blotchy, acne prone skin and uneven skin pigmentation into a radiant and healthy complexion. This procedure involves at best, minimal pain and virtually minimum down time and the results can literally be amazing. IPL (Intense Pulsed Light) is used to treat aging signs, acne and acne scares, sun damage, freckles, age spots, and rosacea. Can be used on the face, neck, shoulders, back, hands, it can be used every part of body with some limitations. it’s also known as broadband light (BBL), photo-rejuvenation, or photo-facial. The light penetrates the skin at a range of wavelengths that targets red and brown spots, resulting in a more even skin tone. IPL also brightens the skin. Depending on the severity of the symptoms, results can be seen in one to three treatments. Also available for hands, neck, decollate, back and shoulders Contact our Medical Aesthetician for more information. LED stands for light-emitting-diodes. First information by NASA: LED works by sending energy-producing packets of light into the deeper layers of the skin. LED Light based facials are one of the gentlest skin rejuvenation processes. Use of Light Emitted Diodes (LED) allows clients to transform red, blotchy, acne prone skin and uneven skin pigmentation into a radiant and healthy complexion. This procedure involves at best, NO pain and virtually NO down time and the results can literally be amazing. Yellow (590 nm) — Immune System Stimulate lymph and nerve faculty, strengthen muscle and improve immunization system. Also helps to balance and ease sensitive skin. LED light therapy’s the results won’t be as dramatic as plastic surgery, IPL or laser, but it’s a gentler, more natural, less expensive way to go. Professional LED treatments are given by certified Medical Aesthetics Practitioners or dermatologist set up, or Medi spa usually those with a serious focus on skin care. Why I choose The Light NOT the Laser? LED treatments are painless, cool and relaxing, and unlike IPL or laser treatments, carry no risk of burning. Unlike IPL, LED treatments don’t generate any heat. They’re even relaxing. LED light is not harm full for eyes. LED treatments are a good choice for people who want to boost collagen or treat acne. If you want to treat brown spots, broken capillaries, spider veins, and diffused facial redness, you are better off getting IPL treatment. Both LED and IPL work best in conjunction with a regular skin care routine that you develop with your Aesthetic Practitioner. LED light therapy can be a stand-alone treatment or part of a facial. LED light therapy work all parts for body for Rejuvenation. Contact Medical Esthetic Practitioner of Aura Skin Care and Laser Burnaby for more information. The Professional LED protocol salon treatments are recommended two to three times a week for a course of four to six weeks. Ideal for pre-wedding prep or before a big event, a session only takes 30 minutes. At aura skin care and laser, we recognized that every skin is unique. According to skin type and condition our facial are Customized. It is essentially a multi-step skin treatment that is one of the best ways to take care of your skin. In the process facial cleanses, exfoliates, and nourishes the skin, promoting a clear, well-hydrated complexion and can help your skin look younger. You also receive advice on the best way to take care of your skin. A facial works best when it is part of an on-going program of skin care. This best Advanced Brightening facial treatment is designed for those with no serious concerns, but whose skin needs a little brightening. It is perfect before a special occasion or as a skin maintenance treatment. This facial aim to increase cell renewal with improving your skin’s tone, clarity and overall health. The elimination of impurities and excess oils as well as gentle exfoliation leaves the skin fresh and glowing. The use of high strength antioxidants helps to reinforce the skin’s natural defences against the environment to help prevent free radical damage, which leads to premature skin ageing. Why I Need Brightening Facial? Corrective superficial skin peels involve the use of mild acids to rejuvenate the facial skin and are an excellent option for the treatment of dry skin, acne prone skin, sun damaged skin and mild wrinkles. Like our facials, the chemical peels are customized to each patient’s individual cosmetic needs and goals. These therapeutic services stimulate collagen and elastin, improve fine lines, discoloration, sun damage, dehydration, acne and rosacea. We offer a wide range of chemical exfoliation options from light to medium depth peels with little to no downtime. Corrective peels also help to maintain results following clinical or laser treatments. Our most popular peel the Laviesage AHA Peel contains a synergistic blend of powerful ingredients suitable for all skin types. This peel provides dramatic results with virtually no pain, no skin preparation and little downtime. The Laviesage AHA will improve the tone, texture and clarity of the skin; reduce or eliminate age spots, freckles, and hyper-pigmentation, including melasma; soften lines and wrinkles; clear acne skin conditions; reduce or eliminate acne scars; and stimulate the production of collagen, for firmer, more youthful skin. We recommend 2-4 Laviesage AHA Peels a year for optimal results. Laviesage BHA Peel Purify is the most effective acne treatment available today! It contains the original BHA Peel formula plus additional powerful ingredients for superior, consistent results. Benzoyl Peroxide removes bacteria, clears the pores and increases cell turnover Salicylic Acid: causes the cells of the epidermis to shed, opening clogged pores and neutralizing the bacteria within while constricting the pore diameter to prevent further clogging Vitamin C: A powerful antioxidant to remove toxins from the environment Kojic Acid: brightens skin and reduces acne scars. At aura skin care and laser, we recognized the power/roll of oxygen for healthy glowing skin. The Oxy-Generate Rx is a topically increase the oxygen level in the skin. A super hydrating and Brightening Treatment. Also, an effective skin care treatment for – Fine lines, Aging signs, Acne, Rosacea, Sun-damaged skin, Telangiectasia and discoloration. What is La Vie Sage Oxy-Generate Rx? Oxy-Generate Rx is a topically increase the oxygen level in the skin. An effective skin care treatment for – Fine lines, Aging signs, Acne, Rosacea, Sun-damaged skin, Telangiectasia. How is Oxy-Generate Rx unique? Unlike other oxygen facials, which atomize or spray oxygen on the skin, the Oxy-Generate Rx Topical Oxy-Generate Rx increases therapeutic oxygen under air pressure to infuse a special serum of modified hyaluronic acid, essential vitamins, botanicals, antioxidants and amino peptides to the skin. Re-hydrated, plumped up skin in less than an hour will set this treatment apart from any other facial treatments. Why is Oxy-Generate Rx unique? Oxy-Generate Rx is more than just a facial; the combination of oxygen and modified vitamin C and hyaluronic acid creates a visible result instantly. How much oxygen is increase in an Oxy-Generate Rx Treatment? Oxy-Generate Rx treatment increases 30-60 % oxygen in the epidermis. How it works- Oxy-Generate Rx used topically? Oxygen is a natural bactericide (destroys anaerobic bacteria) and helps cool and calm the skin. Oxy-Generate Rx increases oxygen with the Vita C infusion and air enhance the skins absorption of the hydra gel which is rich in vitamins and peptides. Are there any contra-indications to an Oxy-Generate Rx? Chemical peels should not be applied immediately before an Oxy-Generate Rx. Additionally, unpredictable ingredients such as Alpha Hydroxy Acids, Retinols and Hydroquinone should not be applied immediately before or after an Oxy-Generate Rx. No sun exposure for 24-48 hours Use of Spf and sun protection is very important. Oxy-Generate Rx can be used on sensitive, sensitized, and rosacea prone skin conditions. May also be recommended as a cooling calming treatment for post sun and wind exposed skin conditions. How Oxy-Generate Rx will be beneficial for me? Vitamin C is skin lightening agent, activate by oxidation, improves scars and lightens pigmentation. Decreases redness and cool the sensitive skin after sun damage or rosacea. It is technically proven the 28-day cycle of renewal by which the skin was constantly recreating and balancing itself. At aura skin care and laser our unique skin care methods involved rhythmic and soft touch to stimulate the skin and support vitality, radiance and balance. The manual facial is effective and unique regimen that works all without compromising the skin’s protective layer. At aura skin care we respects the skin, allowing it to cleanse, balance and renew itself. Our medical estheticians Knows that your skin is smart, and respects its ability to regulate, protect and renew itself with the proper care. Different strokes of massage, essential oil natural enzymes and masks used. This is the first time team of aura skin care and laser has introduced Ayurvedic technique for facials. Instant ageless manual Face Rejuvenation is not only a stand alone 75-minute treatment. Its three-step process has been adapted to create customized and signature treatment. What makes this treatment unique? The Knowledge passion and skill make this treatment so transforming for clients is, the use of marma – or vital energy – points. Marmas are found all over the body, but are particularly concentrated on the face, neck, and upper chest. Combined with aroma therapy, selected organic essential oils, and a loving attitude, people feel this treatment to be as balancing and energizing as a fully body massage. An added plus, however, is how marmas mobilize the light energy in the body, restoring a youthful glow and natural radiance.